"Beautiful!" I remarked when I found this in a field while focusing through the microscope.One of my technicians who was processing samples received in the morning added "It looks like a bouquet Ma'am!" I gave her a smile and asked her to inform the wards. Many a times we have these eureka moments in the laboratory when we find something prototypical. What matters to us and gives a push is the help it does to decide on the patient's treatment. 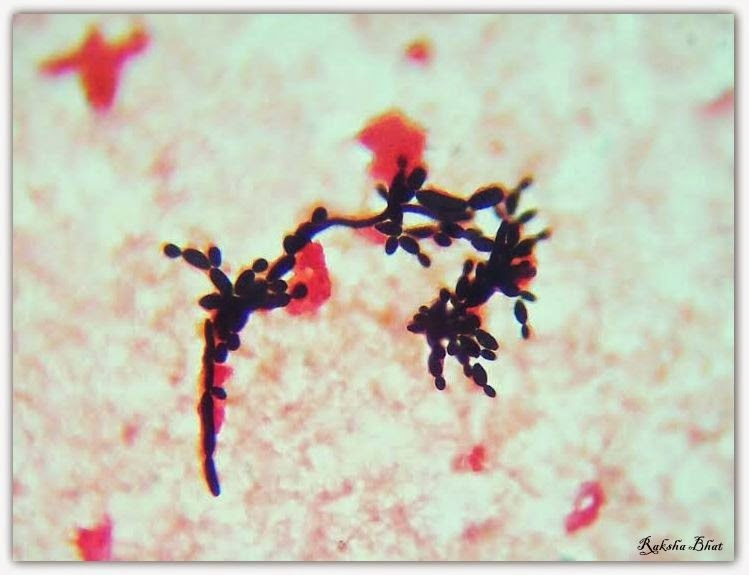 This picture is of a fungus called Candida which grew in the blood culture of a patient diagnosed of sepsis, the moment we informed the clinician about some budding yeast cells being found in the patient's blood he was started on antifungals, we are hoping now that he gets better. We receive hundreds of such samples everyday from different kinds of patients- from neonates in NICU to pre employment check ups to patients with undiagnosed fever to people who come for routine check ups. Some mornings turn into evenings before we realize. "Correct is to recognize what diseases are and whence they come; which are long and which are short; which are mortal and which are not; which are in the process of changing into others; which are increasing and which are diminishing; which are major and which are minor; to treat the diseases that can be treated, but to recognize the ones that cannot be, and to know why they cannot be; by treating patients with the former, to give them the benefit of treatment as far as it is possible. " While an abnormal report interests me scientifically, a report with a final comment as NORMAL satisfies me immensely. In fact I end up imagining the joy on the patient's face each time I click VERIFY. My day either way is made if some help has happened. Today was 'Beautiful!' indeed!